Our chookies have been getting bored. The first sign to watch out for is that they pick on the hen that is at the bottom of the pecking order for no apparent reason. They get so nasty that this bullying is persistent to the point that they usually cause the victim to bleed, usually by pecking the comb. I saw this starting to manifest itself on Thursday when I performed the daily feed. It got worse on Friday, and Saturday afternoon I isolated the victim (Edwina 2). 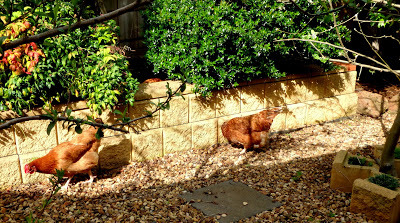 So during Sunday we let the big chooks free range around the garden. Not only do they perform all the weeding for us, but it stops them from being bored. They cleaned up all the grubs and bugs, and demolished any weed game enough to poke its head through the stones. They also provide valuable fertilizer services around the fruit trees and shrubs. 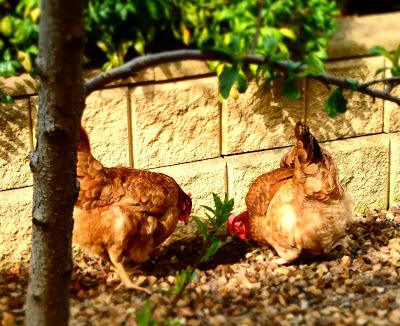 It must be so much fun being one of our chickens. Well fed and not a worry in the world. Now before you decide to let your girls out for some fun, please take this advice onboard. Protect anything that you do not want destroyed. They get into everything including any patch of bare dirt which they turn into a dust bath. 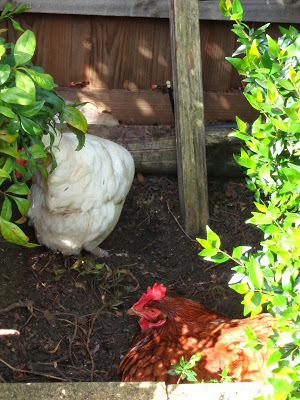 Which is weird, because they have an undercover dust bath in their run. Obviously it is not good enough anymore! 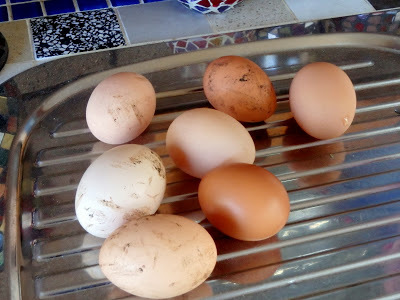 On the egg front, we have been getting at least six per day from ten chooks. Not bad seeing that some of them are well past their laying prime. Now just because the large hens had free range did it mean that everyone was happy. 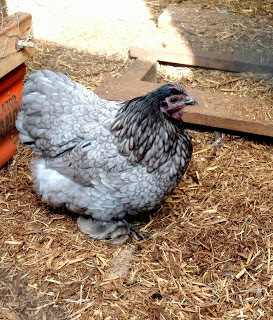 After about five minutes of letting the big girls out, the bantams started kicking up such a fuss. These little girls are more vocal than the ISA Browns, and would if you didn’t know better you would think that they were three times the size! To keep the peace, we decided that to let them free range around the pool area, and Kim babysat these two incase they decided to go for a swim. Thankfully they did not, but Kim needed the rest anyway, and I did my tax return (I get all the fun jobs). 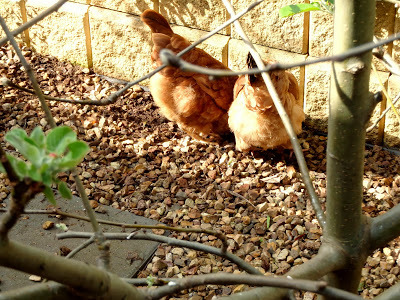 Now that the bantams were happy and quiet, I got back to my tax return. 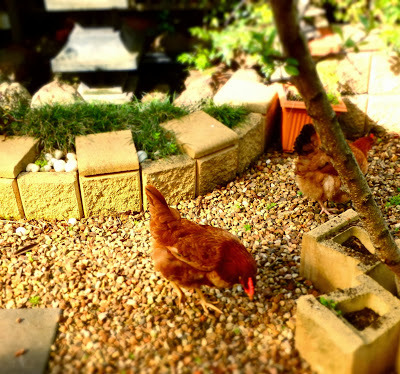 Kim snuck around to the chookhouse garden and took these extra chick bum pictures. Hard workers, my girls. Head down, bum up! See, I told you. Here is a bare patch of dirt. Bunty the old battleaxe, having a bath in nice fresh dirt. It must be such a relief for the old girl. Anyway, with the income tax completed, and after a few hours of free-ranging around the garden and causing havoc among the worm and grub population, we tried to lure them back to their run. It was quite easy. With a small container of cooked rice, Kim lead the way, calling ‘Chook, Chook’, throwing handfuls of rice into their run. You should have seen them. It was just like the Melbourne Cup. It was like they had been just released from the starters gates. It was a sight to see. I rounded up the odd straggler, and closed the gate. 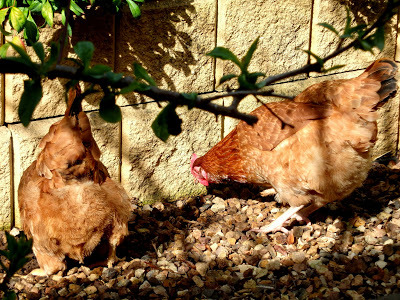 I then scooped up the bantams with one hand and carried them gently to their little run. And guess what? They were all quite and no-one was picking on anyone. They even went to roost quietly! So tomorrow will be the test. The test to see if they are not as bored and be nice to one another. Hopefully, their run around the garden did the trick. 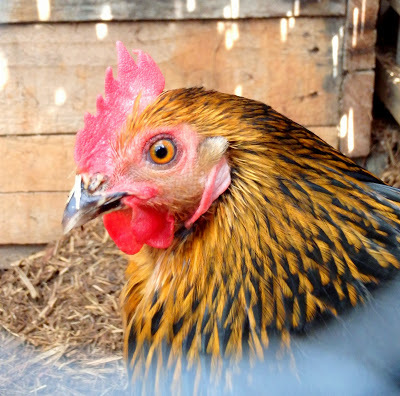 Do you sometimes have chooky troubles when they get bored? What to you do to make them happy? Yesterday I posted another video tutorial over on Littlegreencheese.com. This time I made Cotswold which is a double gloucester style cheese with dried onions and chives. Kim says that it is her most favourite cheese that I have made ever! And she should know, she has tried every single cheese that I have made. Anyway, here is the tutorial. If you want to take a look at the taste test, and grab a copy of the recipe, then pop over to my Cotswold cheese post. I am sure that you will like it. 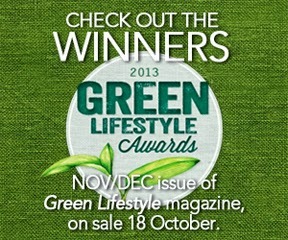 Green Lifestyle Awards – Finalist! I am very excited that I just have to tell you the news! What news you ask? Well, today I received an email from Green Lifestyle Magazine that informed me that I am a finalist in the Green Lifestyle Awards, and to be awarded either the Highly Commended or Winner for the category of ONLINE ECO INFO SITE. Awesome! Thank you so much to those who nominated me, and this site, earlier on in the year. I feel very humbled that you thought that this site was worthy. After all is said and done, I write for you, the reader, and I disseminate as much information as I can (for free) about the simple steps can put you on the path to a sustainable lifestyle in the suburbs. If I can do it, anyone can. However, I also have a dilemma. I have been invited to attend a function in two weeks where they will be announcing the winners and to rub shoulders with other green business leaders. You see, I live in Melton, and the function is in Sydney, which is 886 km (550 miles) away. If I were to travel to attend the two hour ceremony, the carbon footprint would be massive, about half a tonne of CO2-e. In fact I would nearly double my entire year’s emissions in just one day. Therein lays the problem. A moral problem. As much as I would love to attend, due to the distance and the GHG emissions, I have decided not to attend the award function. I called up the lovely people at Green Lifestyle Magazine to let them know, and they fully understood. Maybe I should ask for a video link-up or teleconference? Still, I am very excited to learn the outcome either way. Rock on October 9th when we find out the winners of all the categories. Don’t forget to grab a copy of the magazine when it comes out. I would say “wish me luck!”, but either way I still feel like a winner just because you visited this post! That is prize enough.